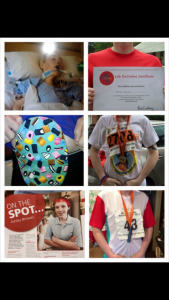 My name is Ashley, I was diagnosed with Crohn’s at the age of 18. I was 14 stone and I tried lots of different medications that did not do much to help my condition, so was put on term steroids that left me with osteoporosis. Sadly as the years went on I could not eat or drink much without affecting my Crohn’s disease, I was always tired and had such terrible painful cramps constantly and was losing weight rapidly. Sadly at the age of 23 on 29th of June 2012 I died 4 times. I arrested at home and a further 3 times, eventually I was put in a medically induced coma for 2 weeks to rest my bowel with 19 pipes and a tracheostomy to help me breathe. I went back to work 2nd of January 2013 and in June I did a 10k run then in September 2014 I did a half marathon. I followed this in June 2015 with a full marathon and in May 2016 I walked from London to Brighton, 62 miles. I also work in my local hospital on the bowel ward, helping people who have all ready had their operation or facing their operation, to show them you can lead a normal life and to answer the questions or worries they have.